Several PJM utilities released their fourth quarter earnings last week, but none made news like Exelon, which warned that it may shut down some of its nuclear generating stations if they can’t compete against subsidized renewable generators and stubbornly low natural gas prices. “We have talked about asset rationalization in the past, and despite our best ever year in generation some of our nuclear units are unprofitable at this point in the current environment due to the low prices and bad energy policy that we are living with,” Exelon CEO Chris Crane said in a conference call. Crane said there are no definite plans to shut down particular plants. Analysts, however, said some single-unit sites in Exelon’s fleet, such as Clinton Nuclear Generating Station, in Illinois, could be targeted. Another possible target is Oyster Creek Generating Station, in New Jersey, which the company already plans to decommission in 2019. It’s not the first time Crane has mentioned shutting down plants. During the third quarter conference call last fall, he said that if wholesale prices didn’t start to rebound, Exelon could start looking at powering down some plants. But it is the first time he’s said that units in its prized nuclear portfolio could be in the bull’s eye. 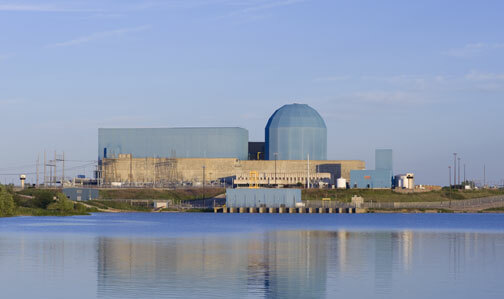 Exelon traditionally has been bullish on nuclear, having built its fleet into the nation’s largest through a series of acquisitions. Ironically, news of possible closures comes at a time when Exelon’s nuclear fleet is running better than ever. Its 10 nuclear plants in Illinois, Pennsylvania and New Jersey produced 134 million net MWh in 2013, their highest output ever, exceeding the previous record set in 2007. The plants operated at a 94.1% capacity factor. Crane’s announcement came during an analysts’ call at which the company reported an increase in fourth quarter and year-end earnings. Fourth quarter earnings were $495 million, or 58 cents per share, compared to $378 million, or 44 cents per share a year ago. Year-end net income grew to $1.72 billion for 2013 from $1.16 billion in 2012, or $2 a share compared to $1.42 a share. Dominion Resources’ year-end earnings reports showed dramatically better numbers than a year ago, with $431 million in fourth-quarter earnings for 2013, or 74 cents a share, compared with a loss of $659 million, or $1.15 a share, a year ago. Full-year figures showed a similar improvement, with 2013 earnings of $1.7 billion, or $2.93 per share, compared with $302 million, or 53 cents per share, a year ago. “Dominion faced a number of challenges in 2013 and we overcame nearly all of them,” said Mark F. McGettrick, Dominion’s executive vice president and chief financial officer during a Jan. 31 earnings conference call. Dominion’s 2012 results suffered from about $1 billion in charges associated with the sales of several fossil stations in the Midwest and Northeast, as well as a permanent shutdown of its Kewaunee nuclear plant in Carlton, Wisc. and Hurricane Sandy-related restoration costs in Virginia and North Carolina. AEP posted operating earnings of 60 cents per share on revenues of $3.8 billion, or a 10-cent increase over the same period last year, when it reported revenues of $3.61 billion. Year-end operating earnings were $1.57 billion, or $3.23 a share, compared with $1.5 billion, or $3.09 a share in 2012. The fourth quarter results show a $15 million drop in operating margin at Ohio Power Co. — $590 million in 2013 compared with $605 million in 2012 — primarily from customer switching in that deregulated territory. The company said it intends to offset any continued losses in that area with increased revenue and earnings from its transmission businesses. PPL can blame costs associated with terminating a power plant lease in Montana for disappointing quarterly and year-end earnings, but officials said solid business unit performance offset the one-time costs. The company’s annual profits plummeted 35% to $1.13 billion, or $1.76 a share, down from $1.53 billion, or $2.60 a share, in 2012. Fourth quarter 2013 earnings showed a loss of $98 million, or 16 cents per share, compared with a profit of $359 million, or 60 cents per share, in 2012. The termination of the Colstrip plant lease cost the company $413 million, or 62 cents per share, which was recorded in the fourth quarter. Earnings from ongoing operations, which do not include the Colstrip charges, were $1.59 billion, or $2.45 per share for the year. The company warned of lower earnings in 2014, “primarily due to lower energy margins in the Supply segment” because of lower energy and capacity prices, partially offset by lower financing costs and lower income taxes. Facing continued skepticism from Wall Street, Exelon Corp. says it will begin shutting down unprofitable power plants if energy prices don't rebound within a year. The brutal winter weather boosted revenue for many PJM companies in the first quarter, even while some were absorbing huge costs from strategy shifts.